Basically he's committing the logical fallacy of the 'argument from incredulity'. He can't get his head around why our deficit is so big so it can't be true. Of cours this assumes he is being honest in that regard, in which case you have to question his IQ or else he just doesn't want to get his head around the very obvious reasons for it, in which case we have to question his integrity. Either way he doesn't come out of it at all well. 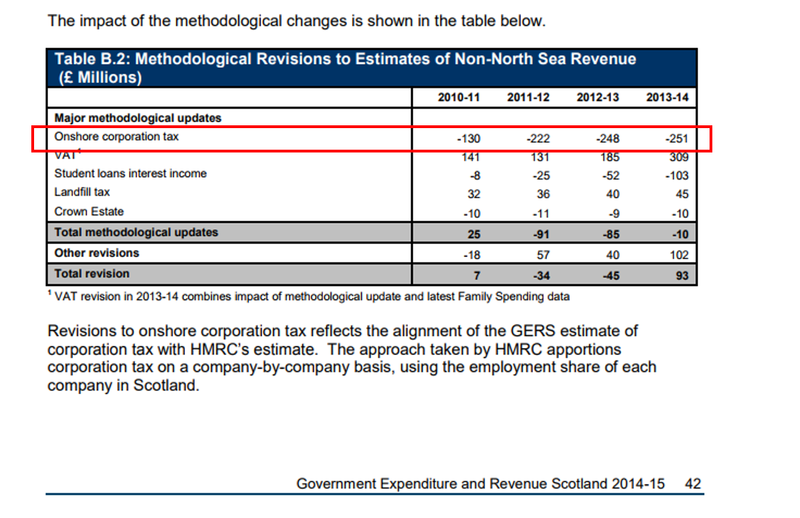 The pushback of GERS is predictable, Scotland has a deficit, no one takes any amusement from it being so. As usual, they use a bogus methodology to dispute GERS. Of the so called £2.7 billion raised from Business rates in Scotland, less than £1.4 billion is actually paid over by private sector business, £700 million is not collected due to Small Business Bonus relief, churches, care homes, charity shops another £700 million is from public sector ie NHS, Police, Fire, Schools, council offices etc etc. £200 per head of so called 'revenue'. 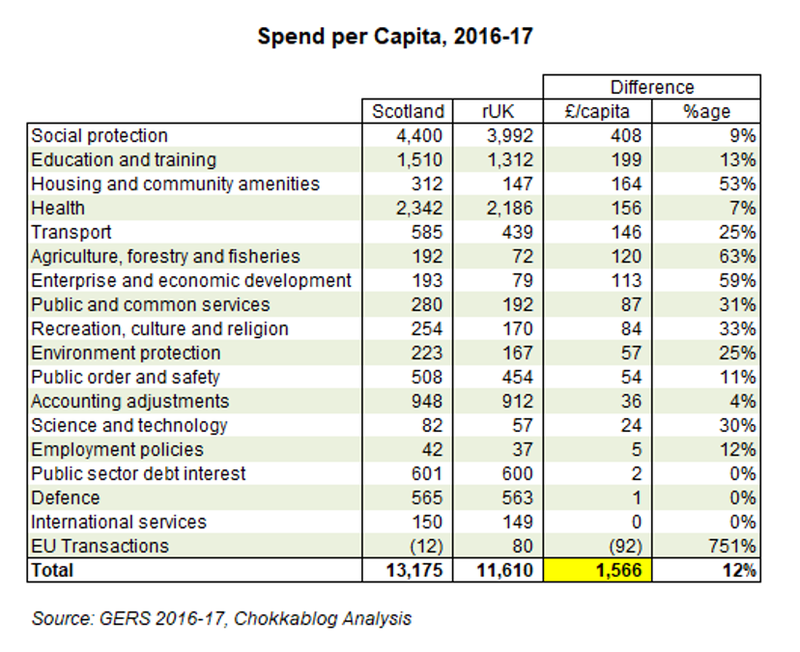 Nor should an independent Scotland expect the Bank of England to handover £965 million a year as currently shown in the GERS income/expenditure tables. 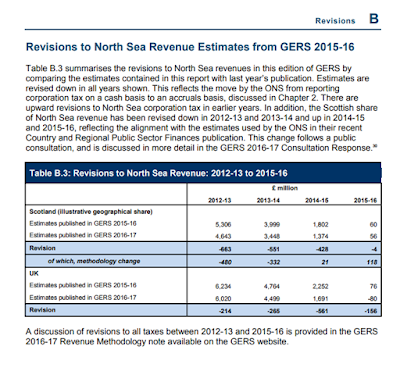 I note with astonishment that GERS provides a Scottish edited version of Country and Regional Analysis database to legitimize GERS figures, upon inspection GERS has omitted spending lines from the database so as to tally up with GERS figures. England if it has any sense should let Scotland go with a zero % share of UK debts, it will save Scotland having to default at a later date. No share of the debt = no share of the assets. I think rest of UK will be on the hook for 100% current defence budget, as well as diplomatic missions, debt interest etc. On the plus side for rest of UK a yearly £6 billion (=current Scottish deficit, minus debt interest, defense and international services) won't be heading to Scotland to never be paid back. 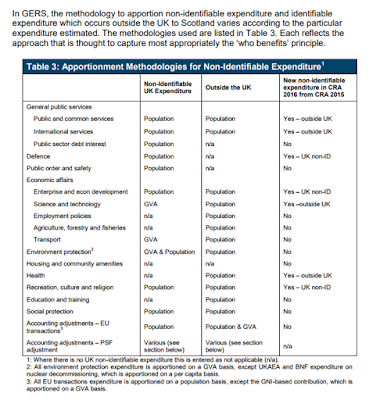 As a strong SNP and Independance supporter I accept GERS and whilst I might look for the odd hole here and there you have to accept there are those who know much more about these things than I and Mr Murphy. Kevin, your info is detailed and (for my brain) overwhelming. It's faultless. 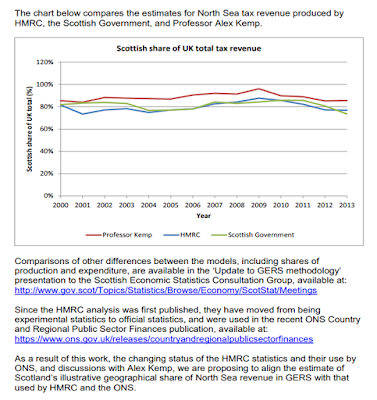 I do have a question based on the GERS outcome, ie the deficit v rUK. Q) would it be correct in saying that the SE of UK are the ones supplementing (for use of a better word) everyone and not just Scotland? ie those broad shoulders everyone seems to like. "Q) would it be correct in saying that the SE of UK are the ones supplementing (for use of a better word) everyone and not just Scotland? ie those broad shoulders everyone seems to like." Hi Kevin, always enjoy your posts and interesting seeing how the GERS accuracy debate, such as it is, has played out over the last few days. 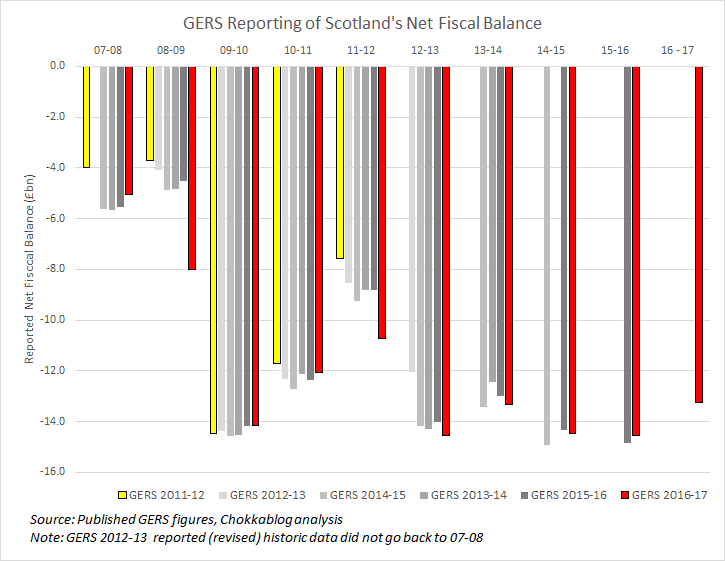 However I am very confused about your 'GERS Reporting of Scotlands fiscal balance' graph. Second, just looking at your graph data, I count 5 years in which the first data point shows a lower deficit, and 4 in which it is higher, so it's not 'nearly always'. In addition, the corrections have generally been to lower deficits more recently. Here's a tricky one for anti-independence campaigners. While you want the Conservatives and/or Labour to win control of Holyrood in 2021, you wouldn't want them doing too well. 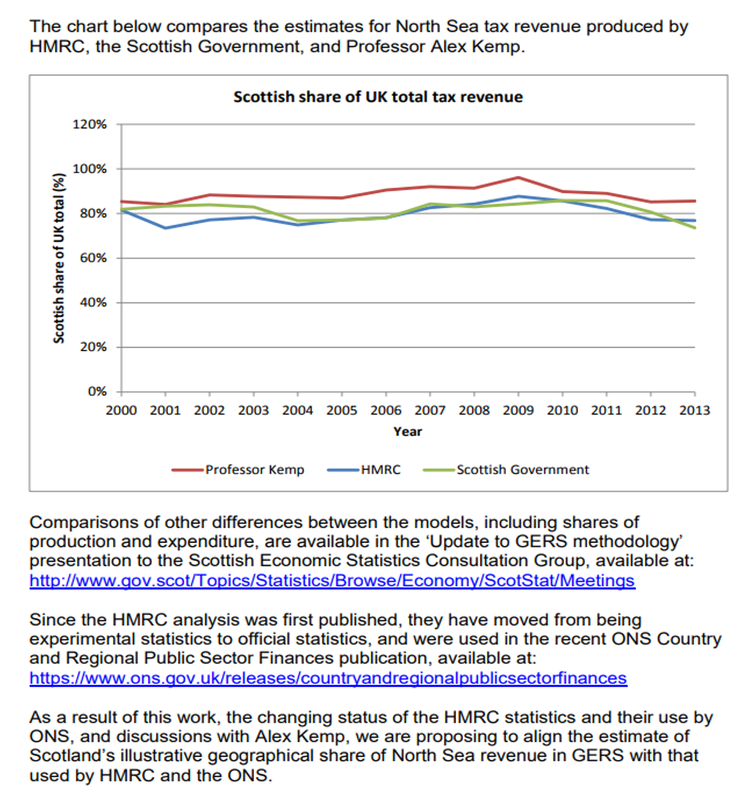 There's a danger for opponents of independence that if Scotland's economy ever improves to the extent that tax revenues increase and spending on poverty, health and social problems decrease, then the situation with GERS might show Scotland could prosper with greater control over the economy. This would risk doing the SNP's job for it. 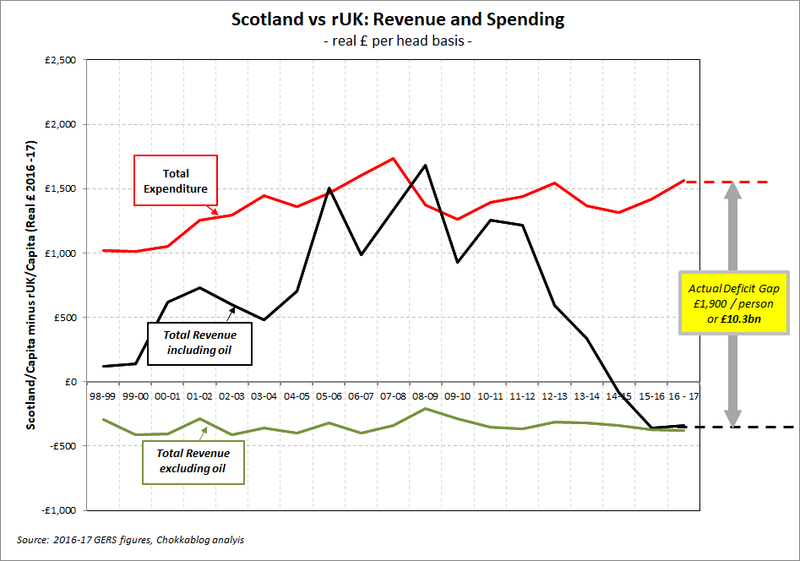 The parties against independence need to be able to show that Scotland is economically weak enough to need the Union. 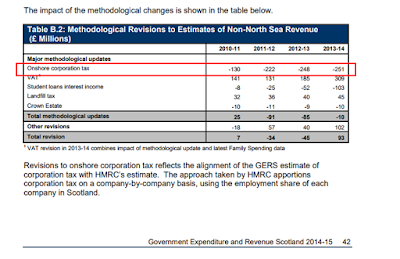 Lab/Cons would need the economy to do well enough in Scotland to remain in power at Holyrood but have a poor enough fiscal position through GERS to show that the economic case for independence remains in trouble. That's a bit of a Catch 22. A valiant effort Mr Hague, but I'm afraid that Mr Murphy is famed for getting very angry when contradicted by facts and infallibily blames the messenger for bringing bad news. For those saying: "what would you say if the numbers were different" - I'd recognise the reality of those figures and we could then move on to a wider debate about the arguments around union vs separation. All I am doing is asking that the debate take place based on a fair presentation of the facts - is that such a weird thing to be doing? As some may be aware, I am also investing considerable effort into an initiative that looks at those wider arguments and will attempt to facilitate a broader conversation of the topic. The economics aren't "the case" - but when people lie about the economics, they need to be called out on it. Does it fairly represent your argument? Why do you want Scotland not to leave the Union? That "rebuttal" is so feeble as to not merit a detailed response. 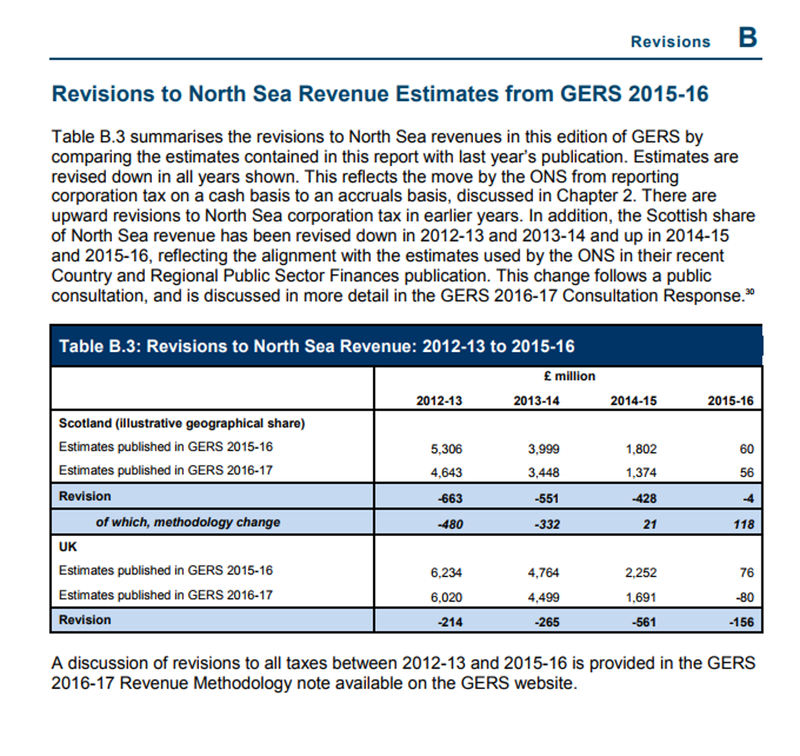 Indy supporters like myself need to stop allowing the GERS data to be a focus for grievance. 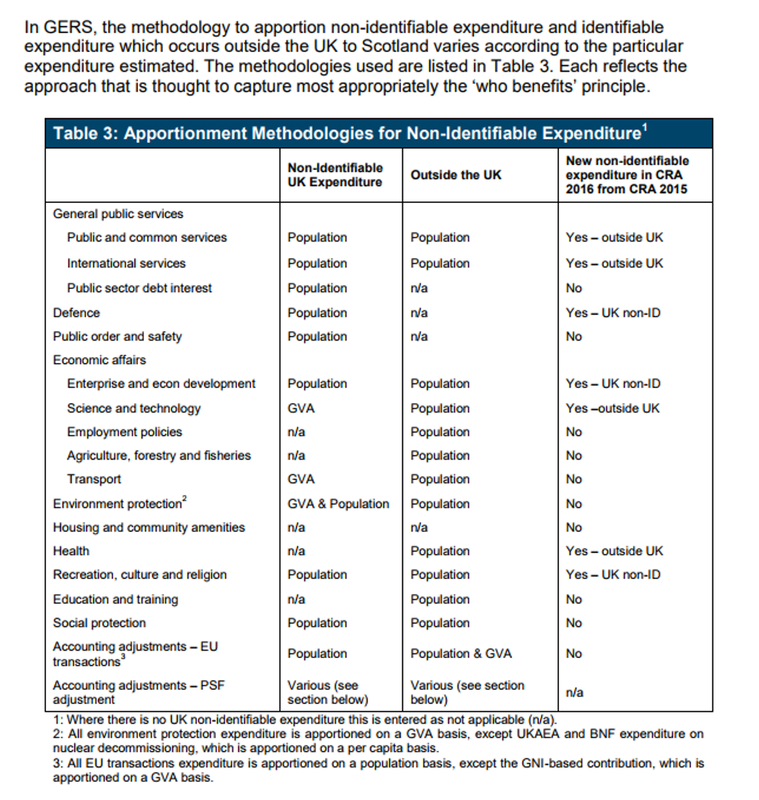 Nationalists are allowing the debate to be on false arguments trying to debunk GERS. This then becomes the headlines and the so-called silver bullet for/against. The Scot Gov accepts GERS, UK gov accepts GERS, I accept GERS. Mr Murphy is not helping and is wrong. An Independance Scotland couldn't exist until sometime in the 2020's when the economic deficit argument will be less weighted. So, fellow independant thinkers (who will follow Kevin's blog like stalkers), the argument is bigger and broader. Independence arguments should be about society, culture, frustration, economics, europe, priorities and ownership compared with UK gov thinking. You ask - why do you want Scotland not to leave the Union? I guess I'm not overly fussed either way at the moment. Personally for me, the moment has gone and probably never to return. So there's probably not much point worrying about it. Far more important things in life, like having a good time or bringing up a family. And to be honest, folk in Wales, England and Northern Ireland are a good laugh. I've had some good trips there. Doesn't seem like all the hassle is worth it.